The above info came from Grace Elizabeth Bellerby, and was edited by yours truly (contact me). The image came from Princess Tutu. Princess Tutu is a magical girl anime, other such anime include Cardcaptor Sakura, and Legend of The New Snow White Pretear... the genre was of course made famous in the west by Naoko Takeuchi's Pretty Solider Sailormoon. Ahiru is our main character. She is a clumsy, friendly, girl who daydreams of dancing with her 'Prince' Mute (according to some sources his name is Mytho). She then find out that Mute actually IS a prince and she is both his saviour - the magical ballerina Princess Tutu - and no more than a little yellow duck (note her name means duck) transformed into a girl by the late storyteller Drosselmeyer. In the story that Drosselmeyer was writing when he died, a prince was fighting a monster raven, but as the story was left unfinished it would seem they were doomed to fight an unending battle. Neither could accept this and they both came out of the book.. and the prince took out his heart and shattered it in order to seal the raven away. This worked, but it meant that the prince's heart scattered throughout the village, and that stories started to come to life. 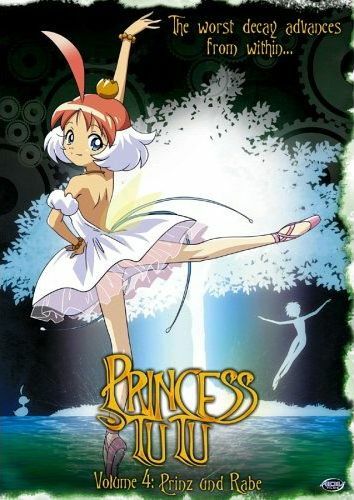 Editor's Note: Princess Tutu lasted for two seasons on Japanese television. The first season consisted of 13 30-minute episodes, while the second season consisted of 24 15-minute episodes. However, every pair of 15-minute episodes tells one 30-minute story. Additionally, there were also 3 specials, but I'm not sure if those were 30 minutes or 15 minutes each. If you know, please contact me. The above description came from Grace Elizabeth Bellerby, and was edited by yours truly (contact me). Princess Tutu is a dramatic and fantastic anime about a clumsy girl named Duck. She attends a ballet school and she works hard to achieve her dream, to dance with the handsome Senior Mytho. Senior Mytho (Mytho-sempai) is a emotionless young man who has lost his heart. The reason for this is because he is an incarnation of a Prince inside of a story called The Prince and The Raven by the story teller, Drosselmeyer. The Prince and the Raven is about a young prince who journeys to fight an evil Raven. Drosselmeyer died before he finished the story so the Prince and the Raven continued to fight for many years. The Raven and the Prince both decided they had enough so the Prince sealed the raven away with his heart. Now the pieces of the prince's heart are scattered. Duck discoverers that she is Princess Tutu, an amazing ballerina who collects the shards of the prince's heart and returns them to Mytho. But there is always a catch. There is another side of Duck. Since Duck is not perfect, she sometimes acts like a duck and has the same mannerisms as ducks. So every time Duck does something that resembles a duck, she actually turns into one. The way she can turn back into a human is by dumping water over her head, but when she turns back in a human, she is naked. I would give this anime a 4.5 out 5 stars for the story and wonderful scenery. The above description came from Chandler, and was edited by yours truly (contact me).